With training camp set to begin this week, there is one question that everyone is looking to have answered between now and the regular-season opener on Sept. 13: How on earth are the Broncos going to patch together an offensive line that can protect Peyton Manning? It’s a fair question, given that Denver’s o-line was a complete disaster at the end of last season and the team hasn’t done anything of note to improve things. If anything, the situation has gotten worse, with Ryan Clady being lost for the year with a torn ACL, Orlando Franklin bolting for San Diego in free agency and Manny Ramirez getting shipped to Detroit in a trade. 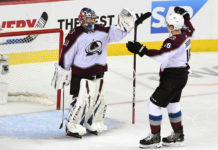 But the hodgepodge of players that the Broncos believe they can piece together to form a respectable offensive line is far from the only question that needs to be answered this summer. In fact, there are four others mysteries that will be burning throughout the long, hot days at Dove Valley. 1. Who is going to be the starting free safety? Few people in Denver shed a tear when Rahim Moore left town during the offseason, landing in Houston as a free agent. But his departure created a hole in the Broncos defense, one that wasn’t addressed in a significant way through free agency or the draft. As it currently stands, there isn’t a player on the roster who appears ready to replace the four interceptions Moore posted in 2014. Initially, newcomer Darian Stewart will get a shot to start alongside T.J. Ward. After four years as a spot player in St. Louis, Stewart spent last season in Baltimore, starting 14 games for the Ravens. He was underwhelming, recording 40 tackles and one interception; those aren’t exactly the numbers of a ball hawk and/or playmaker. So don’t be surprised if others see plenty of time with the first team during camp and preseason games. David Bruton has been a great special teams player during his six seasons with the Broncos, but he hasn’t been able to get on the field much beyond that role; his five career starts are evidence that he’s a career backup. Of course, that’s a ton of experience compared to the other candidate; Omar Bolden has one start during his first three seasons in the NFL. 2. How do the Broncos replace Wes Welker? The Broncos starting wide receivers are as good as any duo in the league; both Demaryius Thomas and Emmanuel Sanders are game-breaking pass catchers with Pro Bowl-caliber skills. But beyond them, Denver is pretty thin at wideout. Without Wes Welker to round out the three-receiver set, Manning is a little light on weapons. Most expect Cody Latimer to step up, but it would be a major leap for him to match Welker’s numbers from 2014. To go from two catches for 23 yards as a rookie to 49 catches, 464 yards and two touchdowns in year two would be a huge jump, especially for a guy who didn’t know the playbook last season and is now having to learn yet another pro offense. But last year’s second-round pick has the best chance of being the No. 3 receiver. If Latimer fails to meet the challenge, the Broncos are left with Andre Caldwell and eight people who have never been in my kitchen as options – and that’s not good. 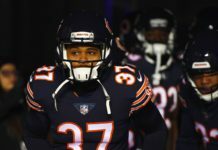 During his three seasons in Denver, Caldwell has caught a grand total of 22 passes; at 30 years old, it’s unrealistic to assume he’ll suddenly turn into a different player. 3. What happens if Brandon Marshall and Danny Trevathan aren’t healthy? The past two seasons, the Broncos have discovered a couple of diamonds in the rough on defense. 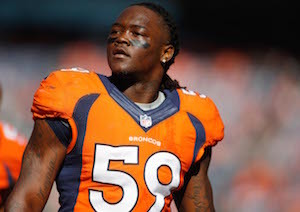 In 2013, Trevathan blossomed into a star. Last year, it was Marshall who came out of nowhere to be an impact player in the middle of Denver’s defense in relief of Trevathan. So on paper, the orange and blue are set at middle linebacker heading into this year. But thanks to injuries, that’s far from the case. Trevathan missed most of last season with a recurring knee injury, something that required major surgery (depending on who is answering the question); he won’t be 100 percent ready to go at the start of camp. And Marshall will be limited, as well; he’s coming off of a foot injury that slowed him late last season. If Trevathan and/or Marshall can’t go, the Broncos are in trouble. Why? Because there isn’t any depth behind them. Steven Johnson started seven games last year for Denver, but he didn’t exactly light the world on fire. Lamin Barrow and Corey Nelson were 2014 draft picks who did very little as rookies, so no one knows if they can improve in year two. Todd Davis came over from New Orleans last season and repeatedly showed why the Saints cut him. And Danny Mason and Reggie Walker are unknowns for a reason. 4. Who is going to play defensive end? During his three seasons as a Bronco, Derek Wolfe has been underwhelming. Since posting six sacks as a rookie, Denver’s first pick in 2012 (36th overall) has regressed badly. Two years ago, the decline was due to a strange series of medical problems that plagued him all season long. But last year, Wolfe was simply a non-factor, posting just 26 tackles and 1.5 sacks despite starting all 16 games. Losing Wolfe for the first four games due to suspension isn’t a huge problem; the shoes his replacement will have to fill aren’t exactly Shaq-like in size. But that said, someone is going to have to start opposite Malik Jackson in Denver’s new three-man defensive line. And there aren’t a lot of known commodities as options. Antonio Smith is the logical choice, as the 12-year veteran has started 133 games during his career and has proven to be effective during that time. But his potential legal issues in Houston could derail those plans at any minute. 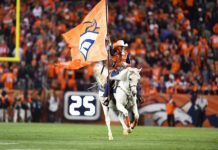 If it’s not Smith, the Broncos will be forced to choose between Vance Walker (a 28-year-old journeyman), Gerald Rivers (three career games played), sixth-round pick Darius Kilgo, and rookie free agents Chuka Ndulue and Josh Watson. Without a doubt, the Broncos won’t be a Super Bowl contender if some combination of Ty Sambrailo, Chris Clark, Ryan Harris, Gino Gradkowski, Shelley Smith and Ben Garland can’t emerge to join Louis Vasquez along the offensive line. But finding an answer to the four questions above will be equally as important. Denver needs someone to become a playmaking free safety and the team’s No. 3 wideout. They also need to get healthy at middle linebacker and find a defensive end who can hold down the fort for four games. On Friday, they’ll start to find out if those things can happen. If they can’t, the mix-and-match offensive line will be just one of the issues the Broncos are forced to deal with in 2015.